The Boeing 757 is a mid-size, narrow-body twin-engine airliner that was designed and built by Boeing Commercial Airplanes. It is the manufacturer's largest single-aisle passenger aircraft and was produced from 1981 to 2004. The twinjet has a two-crew member glass cockpit, turbofan engines of sufficient power to allow takeoffs from relatively short runways and higher altitudes, a conventional tail and, for reduced aerodynamic drag, a supercritical wing design. Intended to replace the smaller three-engine 727 on short and medium routes, the 757 can carry 200 to 295 passengers for a maximum of 3,150 to 4,100 nautical miles (5,830 to 7,590 km), depending on variant. The 757 was designed concurrently with a wide-body twinjet, the 767, and, owing to shared features, pilots can obtain a common type rating that allows them to operate both aircraft. Eastern Air Lines and British Airways placed the 757 in commercial service in 1983. The narrow-body twinjet succeeded earlier single-aisle airliners, and became commonly used for short and mid-range domestic routes, shuttle services, and transcontinental U.S. flights. After regulators granted approval for extended flights over water (ETOPS) in 1986, airlines also began using the aircraft for intercontinental routes. Major customers for the 757 included U.S. mainline carriers, European charter airlines, and cargo companies. The airliner has recorded eight hull-loss accidents, including seven fatal crashes, as of September 2015[update]. Production of the 757 ended in October 2004, after 1,050 had been built for 54 customers. The 757-200 was by far the most popular model, with 913 built. Diminished sales amid an airline industry trend toward smaller jetliners led Boeing to end production without a direct replacement, in favor of the 737 family. The last 757 was delivered to Shanghai Airlines in November 2005. In July 2017, 666 of the narrow-body twinjets were in airline service; Delta Air Lines was the largest operator with 127 aircraft. The 7N7 made its Farnborough Airshow debut in 1982 as the 757-200. The 757 was intended to be more capable and more efficient than the preceding 727. The focus on fuel efficiency reflected airline concerns over operating costs, which had grown amid rising oil prices during the Yom Kippur War of 1973. Design targets included a 20 percent reduction in fuel consumption from new engines, plus an additional 10 percent from aerodynamic improvements, versus preceding aircraft. Lighter materials and new wings were also expected to improve efficiency. The maximum take-off weight (MTOW) was set at 220,000 pounds (99,800 kg), which was 10,000 pounds (4,540 kg) more than the 727. The 757's higher thrust-to-weight ratio allowed it to take off from short runways and serve airports in hot and high climates, offering better takeoff performance than that offered by competing aircraft. Competitors needed longer takeoff runs at airports at higher elevations, with higher ambient temperatures and thinner air. Boeing also offered options for higher payload capability. The twin-engine configuration was chosen for greater fuel efficiency versus three- and four-engine designs. Launch customers Eastern Air Lines and British Airways selected the RB211-535C turbofan built by Rolls-Royce, which was capable of 37,400 pounds-force (166 kN) of thrust. This marked the first time that a Boeing airliner was launched with engines produced outside the U.S. Domestic manufacturer Pratt & Whitney subsequently offered the 38,200 pounds-force (170 kN) thrust PW2037, which Delta Air Lines launched with an order for 60 aircraft in November 1980. General Electric also offered its CF6-32 engine early in the program, but eventually abandoned its involvement due to insufficient demand. As development progressed, the 757 increasingly departed from its 727 origins and adopted elements from the 767, which was several months ahead in development. To reduce risk and cost, Boeing combined design work on both twinjets, resulting in shared features such as interior fittings and handling characteristics. Computer-aided design, first applied on the 767, was used for over one-third of the 757's design drawings. In early 1979, a common two-crew member glass cockpit was adopted for the two aircraft, including shared instrumentation, avionics, and flight management systems. In October 1979 the nose was widened and dropped to reduce aerodynamic noise by six dB, to improve the flight deck view and to give more working area for the crew for greater commonality with the 767, as the T-tail was substituted by a conventional tail earlier in the year. Cathode-ray tube (CRT) color displays replaced conventional electromechanical instruments, with increased automation eliminating the flight engineer position common to three-person cockpits. After completing a short conversion course, pilots rated on the 757 could be qualified to fly the 767 and vice versa, owing to their design similarities. Boeing built a final assembly line in Washington at its Renton factory, home of 707, 727, and 737 production, to produce the 757. Early in the development program, Boeing, British Airways, and Rolls-Royce unsuccessfully lobbied the British aircraft industry to manufacture 757 wings. Ultimately, about half of the aircraft's components, including the wings, nose section, and empennage, were produced in-house at Boeing facilities, and the remainder subcontracted to primarily U.S.-based companies. Fairchild Aircraft made the leading edge slats, Grumman supplied the flaps, and Rockwell International produced the main fuselage. Production ramp-up for the new narrow-body airliner coincided with the winding-down of the 727 program, and final assembly of the first aircraft began in January 1981. British Airways was one of the first customers for the RB211-powered 757. The seven-month 757 flight test program used the first five aircraft built. Tasks included flight systems and propulsion tests, hot and cold weather trials, and route-proving flights. Data from the 767 program helped expedite the process. After design issues were identified, the 757's exit doors received dual-spring mechanisms for easier operation, and the fuselage was strengthened for greater bird strike resistance. The production aircraft was 3,600 pounds (1,630 kg) lighter than originally specified, and recorded a three percent better-than-expected rate of fuel burn. This resulted in a range increase of 200 nautical miles (370 km), and prompted Boeing to tout the aircraft's fuel efficiency characteristics. After 1,380 flight test hours, the RB211-powered 757 received U.S. Federal Aviation Administration (FAA) certification on December 21, 1982, followed by UK Civil Aviation Authority (CAA) certification on January 14, 1983. The first delivery to launch customer Eastern Air Lines occurred on December 22, 1982, about four months after the first 767 deliveries. The first 757 with PW2037 engines rolled out about one year later, and was delivered to Delta Air Lines on November 5, 1984. Eastern Air Lines began domestic 757 operations in January 1983 and later deployed the aircraft on transcontinental routes. Monarch Airlines began 757 charter services in March 1983. In Europe, British Airways, Iberia, and Icelandair were the 757's largest mainline customers, while other carriers such as Lufthansa rejected the type as too large for their narrow-body aircraft needs. Many European charter airlines, including Air 2000, Air Holland, and LTU International, also acquired the twinjet for holiday and tour package flights in the late 1980s. In Asia, where even larger aircraft were commonly preferred because of greater passenger volumes, the 757 found fewer orders. A 1982 sales demonstration was unable to attract a purchase from potential customer Japan Airlines, and the first Asian customer, Singapore Airlines, sold its four 757s in 1989 in favor of standardizing on the 240-seat wide-body Airbus A310, just five years after debuting the type on Indonesian and Malaysian routes. The 757 fared better in China, where following an initial purchase by the CAAC Airlines in 1987, orders grew to 59 aircraft, making it the largest Asian market. Operators such as China Southern, China Southwest, Shanghai Airlines, Xiamen Airlines, and Xinjiang Airlines used the 757 on medium length domestic routes. Shanghai Airlines received the last production 757, B-2876, in November 2005. Prior to the United-Continental merger in 2010, the 757 remained the only narrow-body aircraft in use by the large fleets of all three U.S. legacy carriers: American Airlines, Delta Air Lines and United Airlines. During this period, the 757's capacity and range capabilities have remained largely unequaled among narrow-body airliners; when selecting replacement aircraft, airlines have had to either downsize to smaller single-aisle aircraft in production with fewer seats and less range such as the 737-900ER and A321, or upsize to the larger, longer-range 787 Dreamliner and A330-200 wide-body jets. The Tupolev Tu-204, a narrow-body twinjet introduced in 1989 with a design similar to the 757's, is offered in a 200-seat version, which has seen limited production for mainly Russian customers. Within Boeing, the 215-seat, 3,200-nautical-mile (5,930 km) range 737-900ER has been regarded as the closest aircraft in production to the 757-200. In February 2015, Boeing marketing Vice President Randy Tinseth stated that re-engining the 757 had been studied but there was no business case to support it. At the March 2015 ISTAT conference, Air Lease Corporation's Steven Udvar-Hazy predicted the 757 replacement as a more capable, clean-sheet 767-like twin-aisle airplane capable of taking off 7,000 feet (2,130 m) runways like New York LaGuardia, and Tinseth is focused on 20% more range and more capacity than the 757-200. The 757 is a low-wing cantilever monoplane with a conventional tail unit featuring a single fin and rudder. Each wing features a supercritical cross-section and is equipped with five-panel leading edge slats, single- and double-slotted flaps, an outboard aileron, and six spoilers. The wings are largely identical across all 757 variants, swept at 25 degrees, and optimized for a cruising speed of Mach 0.8 (533 mph or 858 km/h). The reduced wing sweep eliminates the need for inboard ailerons, yet incurs little drag penalty on short and medium length routes, during which most of the flight is spent climbing or descending. The airframe further incorporates carbon-fiber reinforced plastic wing surfaces, Kevlar fairings and access panels, plus improved aluminum alloys, which together reduce overall weight by 2,100 pounds (950 kg). A United Airlines 757-200 on final approach, viewed from below, with extended landing gear, flaps, and slats. The 757 was produced in standard and stretched lengths. The original 757-200 debuted as a passenger model, and was subsequently developed into the 757-200PF and 757-200SF cargo models, as well as the convertible 757-200M variant. The stretched 757-300 was only available as a passenger model. When referring to different versions, Boeing, and airlines are known to collapse the model number (757) and the variant designator (e.g. -200 or -300) into a truncated form (e.g. "752" or "753"). The International Civil Aviation Organization (ICAO) classifies all variants based on the 757-200 under the code "B752", and the 757-300 is referred to as "B753" for air traffic control purposes. The 757-200, the original version of the aircraft, entered service with Eastern Air Lines in 1983. The type was produced with two different door configurations, both with three standard cabin doors per side: the baseline version has a fourth, smaller cabin door on each side aft of the wings, and is certified for a maximum capacity of 239, while the alternate version has a pair of over-the-wing emergency exits on each side, and can seat a maximum of 224. The 757-200 was offered with a MTOW of up to 255,000 pounds (116,000 kg); some airlines and publications have referred to higher gross weight versions with ETOPS certification as "757-200ERs", but this designation is not used by the manufacturer. Similarly, versions with winglets are sometimes called "757-200W" or "757-200WL". The first engine to power the 757-200, the Rolls-Royce RB211-535C, was succeeded by the upgraded RB211-535E4 in October 1984. Other engines used include the RB211-535E4B, along with the Pratt & Whitney PW2037 and PW2040. Its range with full payload is 3,850 nautical miles (7,130 km). Although designed for short and medium length routes, the 757-200 has since been used in a variety of roles ranging from high-frequency shuttle services to transatlantic routes. In 1992, after gaining ETOPS approval, American Trans Air launched 757-200 transpacific services between Tucson and Honolulu. Since the turn of the century, mainline U.S. carriers have increasingly deployed the type on transatlantic routes to Europe, and particularly to smaller cities where passenger volumes are insufficient for wide-body aircraft. Production for the 757-200 totaled 913 aircraft, making the type by far the most popular 757 model. At over 4,000 nautical miles (7,410 km), as of February 2015[update], the longest commercial route served by a 757 is United Airlines' New York to Berlin flight; the aircraft assigned to this route cannot fly with full payload. United's 757s assigned to transatlantic routes are fitted with 169 seats. In July 2018, 611 of the 757-200 versions were in service. A UPS 757-200PF arriving at San Jose International Airport. The 757-200PF, the production cargo version of the 757-200, entered service with UPS Airlines in 1987. Targeted at the overnight package delivery market, the freighter can carry up to 15 ULD containers or pallets on its main deck, for a volume of up to 6,600 cubic feet (187 m3), while its two lower holds can carry up to 1,830 cubic feet (51.8 m3) of bulk cargo. The maximum revenue payload capability is 87,700 pounds (39,800 kg) including container weight. The 757-200PF is specified with a MTOW of 255,000 pounds (116,000 kg) for maximal range performance; when fully loaded, the aircraft can fly up to 3,150 nautical miles (5,830 km). Because the freighter does not carry any passengers, it can operate transatlantic flights free of ETOPS restrictions. Power is provided by RB211-535E4B engines from Rolls-Royce, or PW2037 and PW2040 engines from Pratt & Whitney. The freighter features a large, upward-opening main deck cargo door on its forward port-side fuselage. Adjacent to this large cargo door is an exit door used by the pilots. All other emergency exits are omitted, and cabin windows and passenger amenities are not available. The main-deck cargo hold has a smooth fiberglass lining, and a fixed rigid barrier with a sliding access door serves as a restraint wall next to the flight deck. Both lower holds can be equipped with a telescoping baggage system to load custom-fitted cargo modules. When equipped for extended-range transatlantic operations, UPS's 757-200PFs feature an upgraded auxiliary power unit, additional cargo bay fire suppression equipment, enhanced avionics, and an optional supplemental fuel tank in the aft lower hold. Total production for the 757-200PF totaled 80 aircraft. Nepal Airlines' sole 757-200M arriving at Dubai International Airport. Nepal Airlines ordered the 757-200M to fulfill a requirement for an aircraft that could carry mixed passenger and freight loads, and operate out of Tribhuvan International Airport, with its 4,400 ft (1,300 m) elevation, in the foothills of the Himalayas. Patterned after convertible variants of the 737 and 747, the 757-200M can carry two to four cargo pallets on its main deck, along with 123 to 148 passengers in the remaining cabin space. Nepal Airlines' 757-200M, which features Rolls-Royce RB211-535E4 engines and an increased MTOW of 240,000 pounds (109,000 kg), was the only production example ordered. The 757-200SF, a conversion of passenger 757-200s for cargo use, entered service with DHL Aviation in 2001. Modifications by Boeing Wichita in Kansas included the removal of passenger amenities, main deck structural reinforcement, and the installation of a 757-200PF forward fuselage section with a port-side cargo door. The forward two entry doors are retained, resulting in a main deck cargo capacity of 14 pallets, which is one less than the 757-200PF. Environmental controls can be fitted for animal cargo, and rear exits and window pairs are retained on some aircraft. Besides Boeing, Israel Aerospace Industries, Precision Conversions, and ST Aerospace Services have also handled 757-200SF conversions. In September 2006, FedEx Express announced a US$2.6 billion plan to acquire over 80 converted 757 freighters to replace its 727 fleet. Delta Air Lines 757-300 arriving at Los Angeles International Airport. The 757-300, the stretched version of the aircraft, entered service with Condor in 1999. With an overall length of 178.7 feet (54.5 m), the type is the longest single-aisle twinjet ever built, while being shorter than the 187.3 ft (57.10 m) DC-8-61/63. Designed to serve the charter airline market and provide a low-cost replacement for the 767-200, the 757-300 shares the basic design of the original 757, while extending the fuselage before and after the wings. Six standard cabin doors, two smaller cabin doors behind the wings, plus a pair of over-the-wing emergency exits on each side, enable the 757-300 to have a maximum certified capacity of 295 passengers. A higher MTOW of 272,500 pounds (124,000 kg) is specified, while fuel capacity remains unchanged; as a result, the stretched variant offers a maximum range of 3,395 nautical miles (6,290 km). Engines used on the type include the RB211-535E4B from Rolls-Royce and the PW2043 from Pratt & Whitney. Due to its greater length, the 757-300 features a retractable tailskid on its aft fuselage to avoid tailstrikes. Condor ordered the stretched 757 to replace its McDonnell Douglas DC-10s and serve as low-cost, high-density transportation to holiday destinations such as the Canary Islands. Because tests showed that boarding the 757-300 could take up to eight minutes longer than the 757-200, Boeing and Condor developed zone-based boarding procedures to expedite loading and unloading times for the lengthened aircraft. The 757-300 has been operated by mainline carriers Continental Airlines (now part of United Airlines), Northwest Airlines (now part of Delta Air Lines), and Icelandair; other operators have included American Trans Air (the first North American operator), Arkia Israel Airlines, along with charter carriers Condor and Thomas Cook Airlines. Production for the 757-300 totaled 55 aircraft. All 55 were in service in July 2018. Airborne Research Integrated Experiments System (ARIES), a NASA platform for air safety and operational research, was created in 1999 using the second production 757. The aircraft originally flew in the 757 flight test program before entering service with Eastern Air Lines. After NASA purchased the aircraft in 1994 to replace its 737-100 testbed, it was initially used to evaluate a hybrid laminar flow control system, avionics systems for the proposed Northrop YF-23 jet fighter, and the 777's fly-by-wire control system. Equipped with a flight deck research station, on-board laboratories, and two experimental flight decks, ARIES was used for evaluating weather information and landing approach systems, as well as runway friction tests. ARIES went into storage in 2006. The C-32A, a variant of the 757, is the usual air transportation for the Vice President of the United States. C-32 – The United States Air Force (USAF) operates four VIP-configured 757-200s under the designation C-32A for missions including transporting the Vice President of the United States under the callsign Air Force Two. The C-32As are outfitted with a communication center, conference room, seating area, and private living quarters. The USAF also operates two 45-seat 757-200 aircraft, designated C-32B, for use by the U.S. State Department Foreign Emergency Support Team. The C-32As feature the blue-and-white paint scheme used by the USAF for its VIP transport fleet, while the C-32Bs are painted in solid white with minimal identification markings. The first C-32s were delivered in 1998 and replaced C-137 Stratoliner transports. F-22 Flying Testbed – the first 757 built was used in 1998 as a testbed for Lockheed Martin F-22 Raptor avionics and sensor integration. The Boeing-owned aircraft was fitted with a canard above its cockpit to simulate the jet fighter's wing sensor layout, along with a forward F-22 fuselage section with radar and other systems, and a 30-seat laboratory with communication, electronic warfare, identification, and navigation sensors. Krueger flap and Natural Laminar Flow Insect Mitigation Test Program – Boeing commenced a series of test flights on 17 March 2015 with a modified Boeing 757, incorporating new wing-leading-edge sections and an actively blown vertical tail. The left wing has been modified to include a 6.7 m-span glove section supporting a variable-camber Krueger flap which will be deployed during landing and which protrudes just ahead of the leading edge. Although Krueger flaps have been tried before as insect-mitigation screens, previous designs caused additional drag; the newer design being tested is variable-camber and designed to retract as seamlessly as possible into the lower wing surface. Increasing the use of natural laminar flow (NLF) on an aircraft wing has the potential to improve fuel burn by as much as 15%, but even small contaminants from insect remains will trip the flow from laminar to turbulent, destroying the performance benefit. The test flights have been supported by the European airline group TUI AG and conducted jointly with NASA as part of the agency's Environmentally Responsible Aviation (ERA) program. While the left wing tests the Kreuger flaps, the right wing is being used to test coatings that prevent insects from adhering to the wing. Success here will open the door to the application of Natural Laminar Flow to reduce fuel burn. Active Flow Control System – Boeing has mounted 31 active flow jets mounted ahead of the rudder's leading edge. They receive air from the Auxiliary Power Unit (APU). Their purpose is to recover air flow that has separated from the rudder and redirect it to the rudder so that the rudder regains effectiveness, even at high deflection angles. The air exiting the APU is very hot, at 380 °F (193 °C), and is cooled by a heat exchanger mounted under the aft fuselage, which is connected to the ducts running along the front and back of the stabilizer's spars. This ensures an even air supply at all times. In 2009, the Royal New Zealand Air Force flew one of its 757 Combis to Antarctica for the first time. Royal New Zealand Air Force 757 Combi – the Royal New Zealand Air Force (RNZAF) operates two 757s converted to 757-200M standard by ST Aerospace Services for delivering equipment, medical evacuation, troop movements, and VIP transport. A cargo door, upgraded auxiliary power unit, enhanced communications systems, and retractable airstairs are fitted. The two aircraft, which replaced two 727-100QCs, have carried the Prime Minister of New Zealand, as well as flown to the ice-covered Pegasus Field near New Zealand's Scott Base in McMurdo Sound, Antarctica. VIP transport – the 757-200 serves as VIP transports for the President of Argentina under the Presidential Air Group serial Tango 01 and for the President of Mexico under the Mexican Air Force call sign TP01 or Transporte Presidencial 1. A Royal Brunei Airlines 757-200 was used by the Sultan of Brunei in the 1980s before being sold to the Government of Kazakhstan in 1995. The royal family of Saudi Arabia uses a 757-200 as a flying hospital. Microsoft co-founder Paul Allen used a private 757 from 2005 until 2011; the aircraft was then sold to Donald Trump and became known as "Trump Force One" during his 2016 U.S. presidential campaign. The largest 757 operators are Delta Air Lines, FedEx Express and United Airlines; Delta Air Lines is the largest overall, with a 757 fleet of 127 aircraft as of 2018[update]. American Airlines' 757 fleet of 142 aircraft was the largest until 2007, when the carrier retired Pratt & Whitney PW2000-powered models originating from its TWA acquisition in order to have an all Rolls-Royce RB211-powered 757 fleet. Delta subsequently acquired 17 former TWA/American Airlines 757s, and in October 2008, gained 45 more 757s from its acquisition of Northwest Airlines. The cargo carrier with the most 757s is FedEx Express, which operated a 757-200F fleet of 111 aircraft in July 2018. UPS Airlines operate a further 75 of the type, with DHL Aviation and its affiliated companies, DHL Air UK, DHL Latin America, European Air Transport Leipzig, and Blue Dart Aviation, combined operating 35 cargo 757s of various types in 2018. Over the duration of the program, 1,050 Boeing 757s were built with 1,049 aircraft delivered. The prototype 757 remained with the manufacturer for testing purposes. In July 2018, a total of 666 Boeing 757 aircraft of all variants were in commercial service with operators Delta Air Lines (127), FedEx Express (111), United Airlines (77), UPS Airlines (75), American Airlines (34), Icelandair (26) and others with fewer aircraft of the type. As of November 2018[update], the 757 has been involved in 33 aviation occurrences, including 9 hull-loss accidents. Seven crashes and 12 hijackings have resulted in a total of 574 occupant fatalities. The first fatal event involving the aircraft occurred on October 2, 1990, when a hijacked Xiamen Airlines 737 collided with a China Southern Airlines 757 on the runways of Guangzhou Baiyun International Airport, China, killing 46 of the 122 people on board. Two 757-200s were hijacked on September 11, 2001 during a coordinated terrorist attack in the United States; hijackers crashed American Airlines Flight 77 into the Pentagon in Arlington, Virginia, killing all 64 on board and 125 on the ground, and United Airlines Flight 93 was also hijacked, and crashed near Shanksville, Pennsylvania, killing all 44 on board. In January 2011, the FAA ordered fuselage inspections after an American Airlines 757 lost an upper skin panel in flight. Accidents involving pilot error include American Airlines Flight 965, which crashed into a mountain in Buga, Colombia, on December 20, 1995, killing 151 passengers and eight crew members with four survivors, and the mid-air collision of DHL Flight 611 near Überlingen, Baden-Württemberg, Germany, on July 1, 2002, with the loss of two on board plus 69 on a Bashkirian Airlines Tupolev Tu-154. The American Airlines Flight 965 crash was blamed on navigational errors by the crew, while the collision of DHL Flight 611 involved air traffic control errors. Accidents attributed to spatial disorientation due to improperly maintained instruments include Birgenair Flight 301 on February 6, 1996, which crashed into the ocean near Puerto Plata, Dominican Republic, with the loss of all 189 passengers and crew, and Aeroperú Flight 603 on October 2, 1996, which crashed into the ocean off the coast of Pasamayo, Peru, with the loss of all 70 on board. In the Birgenair accident, investigators found that the aircraft had been stored without the necessary covers for its pitot tube sensors, thus allowing insects and debris to collect within, while in the Aeroperú accident, protective tape covering static vent sensors had not been removed. Two private aircraft crashes were blamed on wake turbulence emanating from 757s. On December 18, 1992, a Cessna Citation crashed near Billings Logan International Airport in Montana, killing all six aboard, and on December 15, 1993, an IAI Westwind crashed near John Wayne Airport in California, killing all five aboard. Both airplanes had been flying less than 3 nautical miles (6 km) behind a 757. The FAA subsequently increased the required separation between small aircraft and 757s from 4 nautical miles (7.4 km) to 5 nautical miles (9.3 km). On September 14, 1999, Britannia Airways Flight 226A crash landed near Girona-Costa Brava Airport, Spain, during a thunderstorm; the 757's fuselage broke into several pieces. The 245 occupants evacuated successfully, with 40 requiring hospital treatment. On October 25, 2010, American Airlines Flight 1640, a 757 flying between Miami and Boston, safely returned to Miami after suffering the loss of a 2-foot (60 cm) fuselage section at an altitude of approximately 31,000 feet (9,000 m). After investigating the incident, the FAA ordered all 757 operators in the U.S. to regularly inspect upper fuselage sections of their aircraft for structural fatigue. A Delta Air Lines 757-200, registered as N608DA, is on display at the Delta Flight Museum in Atlanta, Georgia. The aircraft was the sixty-fourth example built. Prior to being moved to its permanent location, the aircraft was repainted into Delta's 'Widget' livery, the livery it wore when it was originally delivered; it is now on static display at the museum entrance. ^ a b c d e "Boeing Marks Completion of its 757 Commercial Airplane Program". Boeing. October 28, 2004. Retrieved September 26, 2014. ^ a b c d e Eden 2008, p. 101. ^ a b c "Boeing 757 incidents". Aviation Safety Network. November 12, 2018. Retrieved November 16, 2018. ^ a b c d e f g "World Airline Census 2018". Flightglobal.com. Retrieved 2018-08-21. ^ a b c d e Norris & Wagner 1998, pp. 143–45. ^ Eden 2008, p. 72. ^ Norris & Wagner 1999, p. 12. ^ a b c d e f Norris & Wagner 1998, p. 144. ^ a b c d e f g h i j k l m Norris & Wagner 1999, pp. 19–20. ^ Norris & Wagner 1999, pp. 18–19. ^ a b Davies 2000, p. 103. ^ a b c Norris & Wagner 1998, pp. 145–47. ^ a b c d e Eden 2008, p. 98. ^ a b c d e Norris & Wagner 1999, pp. 95–96. ^ a b Birtles 2001, p. 12. ^ a b c Norris & Wagner 1998, p. 145. ^ a b c Birtles 2001, pp. 16–17. ^ a b c "Boeing 727 Specifications". Boeing. Retrieved October 26, 2014. ^ Ostrower, Jon, and Wall, Robert, "Boeing weighs options to reprise aging 757s", Wall Street Journal, February 11, 2015, pp. B1–2. ^ a b c d e f Velupillai, David (January 2, 1982). "Boeing 757: introducing the big-fan narrowbody". Flight International. pp. 12, 15. Retrieved February 2, 2011. ^ a b c d e f Velupillai 1982, p. 19. ^ Davies 1990, p. 102. ^ Eden 2008, pp. 98–99. ^ Birtles 2001, pp. 12–13. ^ a b c d e f g h i Norris & Wagner 1999, p. 23. ^ a b c d Velupillai 1982, p. 15. ^ "Boeing refine 757 flight deck". Flight International. 6 October 1979. p. 1098. ^ Norris & Wagner 1998, pp. 151–53. ^ a b c d e f g "757 Passenger" (PDF). Boeing. 2007. ^ a b c d e f g h i j k "757 Airplane Characteristics for Airport Planning" (PDF). Boeing. August 2002. p. 21. ^ Sharpe & Shaw 2001, pp. 9, 17. ^ Davies 2003, p. 96. ^ Birtles 2001, p. 15. ^ Birtles 2001, p. 32. ^ a b c d e Velupillai 1982, pp. 13, 20. ^ Ramsden, J. M. (April 29, 1978). "Europe's Jet v. Boeing's 757". Flight International. Retrieved June 20, 2012. ^ a b c d e Velupillai 1982, p. 20. ^ a b c d Eden 2008, p. 99. ^ Birtles 2001, pp. 22–23. ^ a b c d e f g h i j k l Norris & Wagner 1998, pp. 161–62. ^ a b Sweetman, Bill (March 20, 1982). "Boeing tests the twins". Flight International. pp. 676, 685–86. Retrieved July 15, 2011. ^ a b Birtles 2001, p. 14. ^ a b c Birtles 2001, pp. 22–26. ^ a b c Rinearson, Peter (June 19–26, 1983). "Making It Fly". Seattle Times. Archived from the original on 2012-10-11. Retrieved October 26, 2014. ^ a b c d "Boeing 757-200 Background". Boeing. Retrieved October 26, 2014. ^ a b c d e f g h i j k l m n o p "757 Model Summary". Boeing. April 2011. Retrieved January 27, 2011. ^ Birtles 2001, p. 49. ^ a b c d "Boeing 757: six months in service". Flight International. July 28, 1983. pp. 195–201. Retrieved February 2, 2011. ^ Birtles 2001, pp. 50–51. ^ a b c d e f g h i j k Birtles 2001, pp. 28–29. ^ a b c d e f g h i j k l Eden 2008, p. 100. ^ Dormer, Ian (June 4, 1988). "American and United buy 757s". Flight International. Retrieved July 15, 2011. ^ a b Birtles 2001, pp. 53, 55. ^ Birtles 2001, pp. 26, 52. ^ Birtles 2001, pp. 48–49. ^ a b c d e Birtles 2001, p. 62. ^ Birtles 2001, p. 6. ^ Birtles 2001, p. 25. ^ Birtles 2001, p. 50. ^ Birtles 2001, p. 54. ^ a b Norris & Wagner 1998, pp. 159, 162. ^ a b c d Birtles 2001, p. 26. ^ a b c d e f g h "Concept to Reality – Wake-Vortex Hazard". National Aeronautics and Space Administration. Archived from the original on July 31, 2009. Retrieved July 29, 2011. ^ a b Maksel, Rebecca (May 27, 2008). "Is the Boeing 757 a threat to other airliners?". Air & Space. Retrieved March 25, 2012. ^ "New York/New Jersey/Philadelphia Metropolitan Airspace Redesign Project – FAA's Wake Turbulence Separation Standards" (PDF). Federal Aviation Administration. p. 1. Retrieved July 29, 2011. ^ Birtles 2001, p. 37. ^ a b Norris & Wagner 1999, pp. 96–98. ^ Eden 2008, p. 25. ^ a b c "Analysing the options for 757 replacement" (PDF). Aircraft Commerce. August 2005. pp. 28, 30–31. Retrieved December 19, 2011. ^ a b Norris & Wagner 1999, pp. 101–02. ^ Norris, Guy (August 27, 2002). "Fix sought as 757 backlog nosedives". Flight International. Retrieved December 19, 2011. ^ a b c d Norris, Guy (October 21, 2003). "Sales drought takes 757's scalp". Flight International. Archived from the original on 2012-11-05. Retrieved July 27, 2011. ^ a b Norris, Guy (November 17, 1999). "Boeing looks at 757 slowdown". Flight International. Archived from the original on 2013-05-20. Retrieved July 27, 2011. ^ a b McMillin, Molly (August 10, 2004). "Wichita's final 757 to take a bow". Wichita Eagle. Archived from the original on April 27, 2005. Retrieved April 10, 2012. ^ Kingsley-Jones, Max (April 11, 2003). "Omens good for old 757s despite production axe". Flight International. Archived from the original on 2013-05-22. Retrieved July 27, 2011. ^ a b Birtles 2001, p. 31. ^ a b c "Converted Boeing 757-200 freighter enters service with DHL". Flight International. March 20, 2001. Archived from the original on 2013-05-22. Retrieved July 27, 2011. ^ a b c d "Very special freighters". Flight International. September 19, 2000. Archived from the original on 2012-11-05. Retrieved July 27, 2011. ^ a b "Aircraft Profiles: Boeing 757". Flight International. Archived from the original on July 24, 2012. Retrieved April 1, 2012. ^ Steinke, Sebastian (May 2005). "Last 757 Leaves Final Assembly". Flug Revue. Archived from the original on February 16, 2008. ^ Norris, Guy (February 24, 2004). "Boeing consolidates at Renton as 757 line ends". Flight International. Retrieved December 19, 2011. ^ "Boeing's last 757 rolls off the assembly line". The Taipei Times. October 31, 2004. Retrieved July 27, 2011. ^ Freitag, William; Schulze, Terry (2009). "Blended winglets improve performance" (PDF). Aero Magazine. pp. 9, 12. Retrieved July 27, 2011. ^ Faye, Robert; Laprete, Robert; Winter, Michael (2002). "Blended Winglets". Aero Magazine. Retrieved July 27, 2011. ^ "As fuel costs spiral, winglets are a simple way for airlines to cut fuel consumption". Flight International. June 27, 2008. Archived from the original on 2008-07-03. Retrieved July 27, 2011. ^ Norris, Guy (February 4, 2009). "Continental Receives First Wingletted 757-300". Aviation Week & Space Technology. Retrieved July 27, 2011. ^ a b "World Airliner Census" (PDF). Flight International. 2014. Retrieved January 13, 2015. ^ Ostrower, Jon (September 5, 2010). 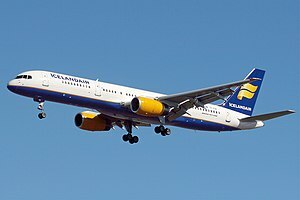 "Icelandair's 757 replacement dilemma". Flight International. Archived from the original on 2010-09-09. Retrieved 2015-07-03. ^ Wallace, James (February 20, 2008). "Push is on for a midrange Dreamliner". Seattle Post-Intelligencer. Retrieved June 7, 2011. ^ "Tupolev Takes on Boeing". Flight International. February 26, 1991. Retrieved May 2, 2012. ^ Eden 2008, p. 186. ^ Karnozov, Vladimir (April 27, 2011). "Tu-204SM struggles as key supporter backs away". Flight International. Retrieved May 3, 2012. ^ Schofield, Adrian (July 20, 2005). "Boeing's 737-900ER Seen As Direct Competitor To A321". Aviation Week & Space Technology. Archived from the original on March 22, 2012. Retrieved 2015-07-03. ^ Stephen Trimble (March 11, 2015). "Udvar-Hazy reveals preferences for Boeing's next project". Flight Global. ^ Velupillai 1982, pp. 15–18. ^ Birtles 2001, pp. 18–19. ^ Norris & Wagner 1998, p. 153. ^ a b c Birtles 2001, p. 47. ^ Norris & Wagner 1998, p. 150. ^ "Carbon brakes for 757". Flight International. July 17, 1982. Retrieved February 2, 2011. ^ a b Norris & Wagner 1999, p. 99. ^ Velupillai 1982, pp. 14–15. ^ Wells & Clarence 2004, p. 252. ^ Birtles 2001, pp. 44, 50. ^ Birtles 2001, pp. 43–44. ^ a b Norris & Wagner 1998, p. 161. ^ Velupillai, David (August 8, 1981). "Boeing 767: The new fuel saver". Flight International. p. 440. Retrieved July 30, 2011. ^ Pace, Eric (May 24, 1981). "How Airline Cabins are being Reshaped". The New York Times. Retrieved February 1, 2011. ^ "Boeing's Big, Quiet 737-300". Flight International. February 12, 1982. Retrieved July 27, 2011. ^ a b c Norris & Wagner 1999, p. 101. ^ Norris & Wagner 1999, p. 112. ^ "Icelandair Takes First Boeing 757-200 with New Interior". Boeing. April 25, 2000. Archived from the original on 2000-06-19. Retrieved 2015-07-03. ^ "Delta Air Lines Announces Installation Of Overhead Bin Extensions". Delta Air Lines. May 15, 2000. Retrieved June 7, 2012. ^ "American's First Aircraft Featuring Bigger Overhead Bins Takes to the Skies". American Airlines. January 17, 2001. Retrieved August 18, 2011. ^ "Heath Tecna to unveil Project Amber for B737s and B757s". Northwest Business Monthly. 2011. Archived from the original on 2012-03-20. Retrieved 2015-07-03. ^ "Heath Tecna unveils Project Amber interior". Aircraft Interiors International. Retrieved 3 July 2015. ^ a b c d Birtles 2001, p. 38. ^ "Boeing 757-300 Background". Boeing. Archived from the original on November 4, 2013. Retrieved 2015-07-03. ^ "Airplane Types and seating maps". Delta Air Lines. Retrieved April 3, 2012. ^ a b "ICAO Document 8643". International Civil Aviation Organization. Retrieved April 1, 2012. ^ "FAA Type Certificate Sheet A2NM" (PDF). Federal Aviation Administration. March 8, 2002. p. 5. Retrieved July 21, 2011. ^ "757-200ER (with BusinessElite version 2) – 75E". Delta Air Lines. Retrieved April 8, 2012. ^ Veronico & Dunn 2004, p. 97. ^ Flottau, Jens; Norris, Guy (January 15, 2015). "Airbus Sees 1,000-Aircraft Market For A321LR". Aviation Week & Space Technology. Retrieved May 9, 2015. ^ Birtles 2001, p. 41. ^ Higgins, Michelle (July 29, 2007). "The Flights Are Long. The Planes Are Cramped". The New York Times. Retrieved April 4, 2012. ^ a b c d e "757 Freighter" (PDF). Boeing. 2007. ^ Norris & Wagner 1998, p. 162. ^ a b Bowers 1989, p. 540. ^ Kane 2003, pp. 551–52. ^ "World Airliner Census". Flight International. December 17, 1988. p. 58. Retrieved April 8, 2012. ^ a b c d "Pemco launches 757-200 Combi conversation program". Aviation Week & Space Technology. October 30, 2010. Retrieved October 30, 2010. ^ a b c Sobie, Brendan (October 21, 2010). "Precision follows Pemco in launching 757 combi conversion". Flight International. Retrieved April 3, 2012. ^ a b c "North American Airlines and VT Systems plan conversion of Boeing 757-200 to Combi configuration". Global Aviation Holdings Inc. December 17, 2010. Retrieved 2015-07-03. ^ Kingsley-Jones, Max (October 13, 1999). "Boeing launches turnkey initiative with DHL freighter conversion contract". Flight International. Retrieved April 3, 2012. ^ "Blue Dart inducts two Boeing 757-200 freighters". Business Standard. May 31, 2006. Retrieved June 2, 2012. ^ "Tasman Cargo Airlines 757-200F". Tasman Cargo Airlines. Retrieved June 2, 2012. ^ "Passenger to Freighter Aircraft Conversions". precisionconversions.com. Retrieved April 1, 2015. ^ Torbenson, Eric; Gunsalus, James (September 26, 2006). "FedEx to spend $2.6 billion to replace its fleet of 727s". Bloomberg. Retrieved April 1, 2012. ^ a b c d e f "Type Certificate Data Sheet" (PDF). FAA. February 16, 2016. ^ a b "757-300 Technical Characteristics". Boeing. Archived from the original on 2013-11-02. Retrieved 2015-07-03. ^ "P&W-powered 757-300 tests begin". Flight International. February 19, 2002. Retrieved June 17, 2012. ^ Norris, Guy (December 2, 1998). "Testing a stretch". Flight International. Retrieved June 8, 2012. ^ Norris & Wagner 1999, p. 96. ^ "American Trans Air Receives First and Second Boeing 757-300s". Boeing. August 8, 2001. Retrieved August 31, 2012. ^ a b Birtles 2001, p. 126. ^ a b c d e "ARIES: NASA's Flying Lab Takes Wing". National Aeronautics and Space Administration. December 1999. Retrieved March 25, 2012. ^ Adams, Denise (August 11, 2006). "State of the Center Updated at Town Meeting". National Aeronautics and Space Administration. Retrieved April 6, 2012. ^ a b c "Factsheets: C-32". United States Air Force. Archived from the original on 2009-06-13. Retrieved 2015-07-03. ^ United States General Accounting Office 2003, p. 197. ^ "Midair Collision Avoidance Guide" (PDF). 305th and 514th Air Mobility Wings, McGuire Air Force Base. September 2007. pp. 5, 8, 12. Archived from the original (PDF) on March 13, 2013. Retrieved June 2, 2012. ^ a b Birtles 2001, pp. 28, 56. ^ Pace 1999, pp. 26–28. ^ "'757 EcoDemo Focuses On Laminar And Active Flow'". Aviation Week. 23 March 2015. Retrieved 23 March 2015. ^ Moody, Elyse (August 5, 2008). "ST Aero Redelivers Combi 757 to RNZAF". Aviation Week & Space Technology. Archived from the original on May 5, 2013. Retrieved 2015-07-03. ^ a b c "RNZAF – Boeing 757". Royal New Zealand Air Force. Retrieved July 21, 2011. ^ Field, Michael (July 8, 2011). "Air force plane struck by lightning". Fairfax News. Retrieved April 6, 2012. ^ Field, Michael (December 17, 2009). "RNZAF jet lands on ice". Fairfax News. Retrieved April 6, 2012. ^ Braslavsky, Guido (April 20, 2009). "El avión de Cristina se averió y tuvo que aterrizar en Caracas". El País (in Spanish). Archived from the original on June 14, 2012. Retrieved August 13, 2011. ^ Guevera, Íñigo (2009). "Defensa Nacional – Ejército, Fuerza Aérea y Marina" (PDF) (in Spanish). Seguridad con Democracia. p. 304. Archived from the original (PDF) on 2012-03-28. Retrieved 2015-07-03. ^ Birtles 2001, p. 52. ^ "Airline profile: Saudi Arabian". Avia Magazine. Retrieved July 21, 2011. ^ "Check out 'Trump Force One' — Donald Trump's personal Boeing airliner". Business Insider. Retrieved 2017-01-16. ^ "World Airliner Census". Flight International. August 21–27, 2007. pp. 46–47. Retrieved July 24, 2011. ^ "American set to return 19 jets when leases up." Fort Worth Star-Telegram, June 8, 2006, p. C1. ^ "Delta Museum – Boeing B-757". Delta Air Lines Air Transport Heritage Museum. Retrieved August 18, 2011. ^ "DHL Express Division – Aviation". DHL Aviation. Archived from the original on December 20, 2012. Retrieved May 6, 2012. ^ "DHL & Lemuir Consolidate Logistics Business in India". DHL Aviation. May 24, 2007. Archived from the original on 2011-01-22. Retrieved 2015-07-03. ^ Cohen, Aubrey (October 5, 2010). "British Airways revives 1983 livery for retiring Boeing 757". Seattle Post-Intelligencer. Retrieved April 1, 2012. ^ Kaminski-Morrow, David (May 10, 2010). "British Airways unveils 'retro' livery as 757 era ends". Flight International. Archived from the original on October 8, 2010. Retrieved July 21, 2011. ^ Kingsley-Jones, Max (October 3, 2010). "BA goes retro for 757 bye-bye". Aviation Week & Space Technology. Archived from the original on October 18, 2012. Retrieved 2015-07-03. ^ "Boeing 757 hull-losses". Aviation Safety Network. November 12, 2018. Retrieved November 16, 2018. ^ "Boeing 757 Statistics". Aviation Safety Network. September 27, 2015. Retrieved September 28, 2015. ^ a b c d e Birtles 2001, pp. 102–03. ^ a b Karp, Aaron (January 10, 2011). "FAA issues AD requiring 'repetitive' 757 fuselage skin inspections". Aviation Week & Space Technology. Retrieved March 25, 2012. ^ "American Airlines jet crashes in the Andes". CNN. December 21, 1995. Retrieved September 9, 2011. ^ a b "Investigation Report AX001-1-2" (PDF). German Federal Bureau of Aircraft Accidents Investigation. May 2, 2004. p. 110. Archived from the original (PDF) on January 23, 2007. Retrieved 2015-07-03. ^ Pope, Hugh (February 10, 1996). "Crash plane may not have been serviced". The Independent. Retrieved November 19, 2009. ^ "Plane crash Britons due home". BBC News. 15 September 1999. ^ "Officials investigate what caused hole in American jet's fuselage". Dallas Morning News. October 29, 2010. Retrieved June 7, 2011. ^ a b Meng, Tiffany (April 28, 2014). "Two new planes". Delta Flight Museum. Retrieved May 18, 2015. ^ Birtles 1999, pp. 55, 116. ^ Civil Jet Aircraft Design. Elsevier. January 1999. Aircraft Data File. ^ Boeing Jetliners. Barnes & Noble. 1998. ISBN 9781610607063. ^ "TWA looks at stretched 757s to replace ageing 767 fleet". Flight International. January 11, 2000. Retrieved April 16, 2017. Birtles, Philip (1999). Modern Civil Aircraft: 6, Boeing 757/767/777. Third Edition. London: Ian Allan Publishing. ISBN 0-7110-2665-3. Yenne, Bill (2005). The Story of the Boeing Company. St. Paul, Minnesota: Zenith Press. ISBN 978-0-7603-2333-5. "757 Commercial Transport Historical Snapshot". Boeing. "passenger version" (PDF). Boeing. 2007. "Type Certificate Data Sheet A2NM" (PDF). FAA. February 16, 2016. "Type Certificate Data Sheet EASA.IM.A.205" (PDF). European Aviation Safety Agency. 17 December 2015. "The big gamble". The Seattle Times. June 19, 1983.